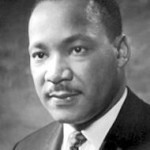 Holy Eucharist Catholic Church is hosting its second annual Martin Luther King Celebration on Monday, Jan. 19 at 2 p.m. This year’s theme is “The Dream: Yesterday, Today and Tomorrow.” The keynote speaker will be Rev. Regena Lynn Thomas, pastor of Allen A.M.E. Church in Atlantic City. Guests will include Cherry Hill Mayor Chuck Cahn, Keith Davis pastor of Camden Dream Center, Kevin Elsey, pastor of Ambassadors Christian Church, Rabbi Lewis Eron of the Jewish Community Relations Council, the Grace and Mercy Praise Dancers from St. John the Baptist Church, Rae Robinson, Frontline Praise and Worship Team ACC and others. The event is sponsored by Knights of Columbus Council 3784, Cherry Hill Township, Cherry Hill African-American Civic Association, Holy Eucharist Catholic Church, Camden Dream Center and the Jewish Community Relations Council. The celebration is open to the public. Holy Eucharist is located at 344 Kresson Road in Cherry Hill.